On Friday, I managed to get my portrait back on track, at least in terms of the placement of facial features. I was happier with the painting, but it still wasn't a likeness, so I needed to work on that. In addition, I needed to work on the perspective and position of the head. In the reference photo, I am not looking at the camera straight on. My head is tilted and in a three-quarter view. To make things even more complicated, my face is not symmetrical (and here I am talking about more than just the average asymmetry found in most faces). I decided to try out these changes on the computer, using a digital overlay instead of rushing right over to the studio to wreck my painting! So I used the photo of the latest version of the portrait (which was day 3) and opened it in Painter IX. Before I got to work, I also opened the reference photo and put a grid over each image, and looked at them side by side. Then I used digital pastel to change the relative position of the eyes and eyebrows. I also changed the line of the hair to indicate a bit of the head tilt. Then I added some shadows around the nose and mouth. 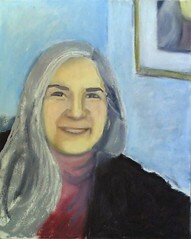 I was much happier because I began to be able to recognize myself a little bit in the portrait. Now I knew what to do next, and would just have to make the same changes in oil bar on canvas. That might sound easy, but I am still struggling to control the oil bars. In fact, it is much easier and faster for me to make the changes in digital pastel, even though I am "drawing" with the mouse. Anyway, I was glad I took the time to work out the changes on the computer. I printed out a two copies of this image to take to the studio on Monday; I annotated one copy, drawing lines and making notes so I would remember what I had changed. To be continued. . . .